Full strand of pretty Aventurine tiny top-drilled drop beads. These are a little bit irregular in shape, but still very cute! Full strand of pretty Black Stone teardrop shaped beads. Full strand of pretty cherry quartz drop beads. Bead size is 25mm long, 12mm wide. Approx. 15 beads per strand. Full Strand of pretty goldstone drop shaped beads. 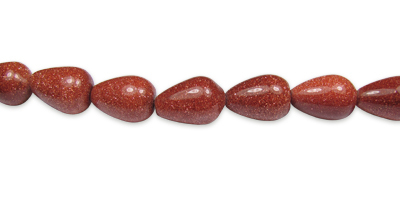 Full strand of beautiful Red Coral beads (dyed) in a top drilled flat drop shape. Big chunky beads! Delicate faceted rose quartz flat briolette (teardrop) shaped natural gemstone beads. Soft cloudy pink colour.